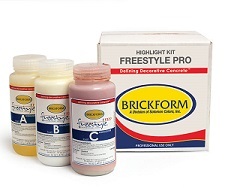 Brickform FreestylePro is a topically applied, opaque, penetrating concrete stain. It is water-based, VOC-free, and fast drying. This makes it excellent for quick repairs and refreshes, indoors and outdoors alike. These qualities make FreestylePro excellent for rejuvenating concrete surfaces, upgrading old surfaces, and repairing discolored concrete. FreestylePro is available in the standard range of Brickform colors. PACKAGING • BRICKFORM FreestylePRO is available in Solid-color kits that consist of 4 bottles; Part A, Part B, Part C, and Part D. Highlighter Kits consist of 3 bottles; Part A, Part B, and Part C.